The insulinotropic response to the ingestion of whey protein and whey protein hydrolysate, independent of carbohydrate, is not known. 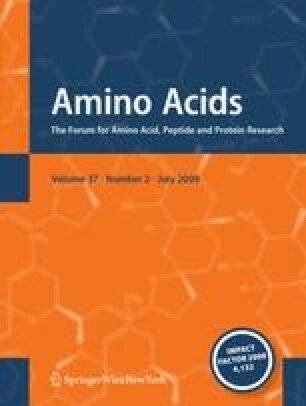 This study examined the effect of protein hydrolysis on the insulinotropic response to the ingestion of whey protein. Sixteen healthy males ingested a 500 mL solution containing either 45 g of whey protein (WPI) or whey protein hydrolysate (WPH). The estimated rate of gastric empting was not altered by hydrolysis of the protein [18 (3) vs. 23 (3) min, n = 16; P = 0.15]. Maximum plasma insulin concentration (C max) occurred later (40 vs. 60 min) and was 28% [234 (26) vs. 299 (31) mM, P = 0.018] greater following ingestion of the WPH compared to the WPI leading to a 43% increase [7.6 (0.9) vs. 10.8 (2.6) nM, P = 0.21] in the AUC of insulin for the WPH. Of the amino acids with known insulinotropic properties only Phe demonstrated a significantly greater maximal concentration [C max; 65 (2) vs. 72 (3) μM, n = 16; P = 0.01] and increase (+22%) in AUC following ingestion of the WPH. In conclusion, ingestion of whey protein is an effective insulin secretagogue. Hydrolysis of whey protein prior to ingestion augments the maximal insulin concentration by a mechanism that is unrelated to gastric emptying of the peptide solution. The authors acknowledge the financial support of Enterprise Ireland (Grant IP 2004-237) and Carbery Food Ingredients.